Pilatus chairman Oscar Schwenk says Pilatus is looking at enhancing PC-12s for next year. With the first four Pilatus PC-24 light jets already in service, the Swiss manufacturer is on target to deliver 23 to 24 this year, 40 next year, and then 50 per year. 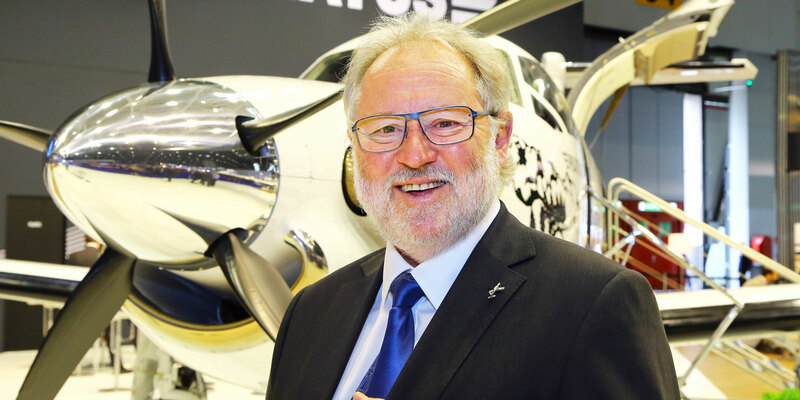 “We have a full order book,” Pilatus chairman Oscar Schwenk told AIN on Wednesday at EBACE 2018. In 2014, Pilatus Aircraft (Booth L115, SD2) took orders for 84 PC-24s, which took production through mid-2020, and then the company closed the order book. Pilatus is now learning more about how the PC-24 performs in the field, how well the production line is gaining efficiency, and what improvements can be made to the jet. The first production PC-24, delivered to fractional-share operator PlaneSense in February, logged 180 hours in the first three weeks of service and now has 300 hours. Five of the jets have been delivered so far. Pilatus’s 24/7 product support teams in the U.S. and Switzerland are up and running, with field service engineers and technicians trained and ready. But so far there have been no problems with those flying in the field, Schwenk said. Next up for Pilatus is proving the rough-field capability of the PC-24. While certification isn’t technically required for that, government operators prefer some kind of approval, Schwenk explained. Pilatus is testing operations on dirt and grass airstrips in combination with steep approaches. For operators, rough-field operations will make available 20,000 additional non-paved airstrips around the world, making it easier to fly closer to the intended destination. The steep approach and rough-field testing should be done by year-end, with approval in early 2019. Having obtained EASA and then, within one hour, FAA type certification in December—the first time in history, according to Schwenk—Pilatus will next obtain type approval in countries with the largest numbers of orders, such as Canada and Australia, followed by countries in the Middle East and Asia.